I've never followed Scandal closely until one year ago or so, after Yellow was released. I would usually find out about a new album when it was already out, so it's the first time I'm actually waiting for it. This waiting is killing me! Is possible to find Honey or any scandal cd in physical stores? I always found it difficult to find JPU Records' cd in regular music shop here in Italy. You'll need to find a big and well supplied store that not only sell mainstream music. The best options should be a Mondadori or Feltrinelli store. cool that Mami and Rina will sing in some songs! I was soo waiting for listening to Rina and Haruna singing a song together too. I do wonder tho why they waited so much to release "Mado wo Aketara" if it's so old. Maybe it didn't fit the mood of any release until now? There you go guys, Haruna is singing with her voice lower again. Wow, "Over" is really powerful! Till now, every song rocks! In every possible sense of the word! So in Honey, we've already heard Koi U, Futari, Take me Out, Platform Syndrome, and now it's Over. How many more? Is it only 5 now? Wait..
Wow! It has a nice sound to it! Over is a straightforward rock tune in a good way I like it! This song feature the second most aggressive pick attack of Mami. I can even imagine how hard Rina hit those cymbals live! Those who will see them in their coming tour beware! Wow! I love Over more than Platform Syndrome. I think I will like this album more than Yellow. Sounds better than Platform Syndrome imo, but who knows, maybe after listening to the full album in hq, opinions may change. Yes, pretty cool solo. The girls seem to be really pushing themselves, can't wait to listen to the full album. "Yellow" was a showcase for them experimenting with a variety of styles, and that is part of that album's charm. There are a few songs on "Yellow" and practically everything Scandal has release since then (with the exception of "I Want You" which I don't think of as a Scandal song) that I am sensing a consistent sound. It is as if they have found their own musical voice. I enjoyed this new tune a lot, especially since there is so much Mami on it. And I agree with whomever pointed it out-- I have also been waiting for her to let it rip on a solo. She has demonstrated this a few times in the past, but the solos were always so short. I'm looking forward to the first live video performance of this. astoriasky wrote: There you go guys, Haruna is singing with her voice lower again. And i'm loving every bit of it, tho her high notes are top notch too. This song gives me shivers, its sooo intense and cool and heavy. 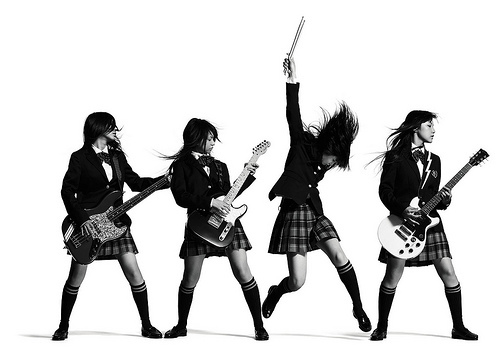 Mami is killin it on the guitar and Rina is dominating those drums. Omg!! Over is just the way I like rock music. Wow! Listening to OVER on repeat, it really grows on you. I hope they put the album on Spotify too. I don't want to rip the cd for this. That was a very awesome solo. Mami-chan is so cool!!! This album just keeps on giving. I'm loving the variety of rock music they have on the upcoming album. From punk with Platform / Koisuru to post grunge with OVER. I can't help but listen to OVER in a loop. Can hardly wait for the 14th!